Interesting exchange of myths between Al-Jazeera and facts by The Jerusalem Center spokesperson. People are concerned with Israeli settlements as an "obstacle to peace" and not one word about Palestinian hate industry, a real obstacle to peace? Itamar Marcus presented developments in Palestinian society, showing recent hate propaganda in video and print. Marcus's presentation detailed the demonization, denial of Israel's right to exist. With such education how is it possible to believe that a new Palestinian state could guarantee regional peace? Impossible. Some people prefer to ignore facts or they underestimate the gravity of the problem generated by the Palestinian hate industry (since Oslo Accords, Arafat started the education of children to hate Jews). If Fatah and Hamas indoctrinate children to hate Jews, it is reasonable to believe that they could ever be partners for peace with the Israelis? Impossible. Iran: The real election figures? 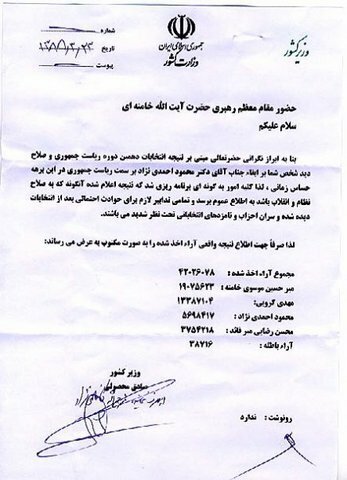 The following are supposedly the real Iran election figures that were suppressed, which came in a letter sent anonymously, purportedly an official IRI document with Islamic Republic of Iran Letterhead. I cannot vouch for the accuracy of the claim. The total for Ahmadinejad looks to be too low, for example. Never fight the battle where the enemy wants you to fight it. Fight the battle on the ground most important to you, where the enemy is weakest. To understand the proper direction of Israeli efforts to present its case, we must understand the significance of Benjamin Netanyahu's speech (see Address by Israeli Prime Minister Benjamin Netanyahu at the Begin-Sadat Center. Palestinians must recognize the right of the Jewish people to self determination. These three conditions form the core of the Israeli case, and efforts at justifying and explaining the case for Israeli peace should focus on them, and not be distracted by gimmicks and side issues such as settlement freezes and outposts. In a hundred years, it will not matter if there was or was not a settlement freeze. But the decision on every one of the above issues will matter for as long as there is a Jewish state and a Jewish people. Palestinians have understood this longer than we have. It is no accident that they have objected strenuously to all three conditions, because they are the heart of peace for Israel. The aim of pro-Palestinian propaganda in the west is to divert attention from the focus of the conflict, defined in those issues, where the Israeli case is strong, to the issue of settlement freeze, and to force a split between the United States and Israel. Regrettably, some of the pro-Israel reaction in recent days has served the Palestinians very well. The discussion of the American opinion poll is especially interesting, because VOA claimed the poll "proved" that the electios were honest. They also claimed falsely that demonstrations were confined to Tehran. [TEHRAN BUREAU] Much has been said about the outcome of the Iranian presidential election, which took place last Friday. President Mahmoud Ahmadinejad's supporters claim that the vote counting was honest. The reformists' supporters hotly dispute that. Extra ammunition has been provided to those who believe that the President was the true victor by the results of a poll taken by the Center for Public Opinion and the New American Foundation between from May 11-20, 2009, asking 1001 Iranians living in Iran for whom they would vote. According to the poll, 34% of the respondents said that they would vote for the President, while 14% said that they would vote for the main reformist candidate, Mir Hossein Mousavi, a former prime minister. There is much evidence to support those who believe that the vote counting was fraudulent. Let us begin with the American poll. According to the poll, 77% of the respondents said that they want the Supreme Leader to be elected directly by the people; 74% favor full inspections of Iran's nuclear facilities to ensure that it will not be used for non-peaceful purposes; 77% favor normal trade with, and full recognition by the United States; 68% favor Iran's government to help the U.S. in Iraq, and 52% favor recognition of Israel in return for U.S. recognition and open. trade. Who espouses such policies? The reformists, not President Ahmadinejad. 90% of the respondents thought that the economy should be the top priority of their government. How has Mr. Ahmadinejad's economic performance been (aside from distributing cash among the poor in the last month of the campaign)? Dismal! Unemployment, inflation, and the costs of housing, fuel, and food have all skyrocketed since 2005. Then, why is it that, while agreeing overwhelmingly with what the reformists advocate, a plurality of the respondents said that they would vote for the President? The answer lies in the Iranian culture. Iranians are notoriously secretive about their political opinions when they talk to strangers, especially when they are called over the phone. In a country where social and political repression has increased dramatically under Mr. Ahmadinejad, the Iranian people are terrified by the possible consequences of honest answers, especially with respect to their preferred candidate. Moreover, the poll was finished on May 20, and that was just before the campaigns were taking off. There was a dramatic increase in the support for Mr. Mousavi (as well as Mr. Mahdi Karroubi, the 2nd reformist candidate) only in the last three weeks of the election. What you would expect from a crackdown in an authoritarian regime. But the crowds shouting "Allah o Akbar" do not suggest that this is a liberal revolution or that the demonstrators have any interest in changing the constitution of the Islamic Republic. Nor do the reports suggest that they have much chance of success. As we speak, I can clearly hear gun shots in the streets and people shouting 'Allah o Akbar' and 'Death to this liar government'. All mobile phones are off, sms has not been working for days, internet is extremely slow, some pages take over 20 minutes to load. Many sites have been filtered, France 24, Deutsche Welle, BBC Persian and BBC World Satellites are not working. VOA Persian just works every now and then, over 100 reformists have been arrested, and we have at least 7 confirmed dead! The atmosphere up to the election day had been one of joy and happiness. All sides have demonstrated side by side, without violence and in friendship. I could go with Karoubi banners into an Ahmadi crowed and we could have friendly discussions. The whole city of Tehran was generally in green. But the day before election when advertising was banned, no one, really no one was wearing green or advertising. This to me shows great respect for the law and how advanced our civil society is. After the announcement of the results, all major squares were suddenly packed with anti riot police, basij, ansare hezbollah and gaurdaye yegan vije. I was stuck in Abbas Abad. It has been the most violent scenes I have every seen. Motorcycles were burning, buses were burning, the government forces were randomly attacking people and blocking both sides of the roads. I have seen women and old people been beaten. These were people passing by. I was hiding in two garages with a friend. People would let us in so we wont get beaten up. But we later found out that basij would even storm houses and destro the dorrs. Sunday Tehran seemed calmer. The University of Tehran dorms was fully isolated. There were at least 200 guards there. At night they attacked the dorms. In central Tehran ansare hezbollah and basij stormed the university building. There are rumours of deaths but nobody knows. In Tehran people were honing their cars and police was smashing cars. There were apparently many riots in Sa adat abad and Shahrake Gharb but I was not there. Yesterday we went to the mass rally. Many did not come because their were reports that there would be shootings. Still 1 to 2 million showed up. From Enghelab square to Azadi and from Azadi square to Sadeghiye the streets were packed. Unfortunately you all know what has happened at the end. Today the atmosphere is even more tense. But in central Tehran, any house we passed had green flags hanging from hanging from it. Everyone you talk to voted for Mousavi. I talked to two well-connected friends in Iran today; this is their analysis. - In their opinion there is no doubt that there was fraud in the elections. - Motivation: The leadership and conservative forces have decided once and for all that there is too much tension in the country, and they want to run the country with no more tensions (between them and the reformists/left). The plan is to immediately open up to the West/US, reduce tensions, focus 200% on the economy, and in the next 4 years reduce inflation and unemployment dramatically and improve people's economic lot significantly. So that in 4 years, they can press the reset button on elections, and the people, having seen 4 years of good economy, vote them into office. And from this point on, no reformist/leftist will ever be allowed to assume power in Iran. This is all well and good on paper - except that it does not include one factor: the people's will and desire! We're talking pseudo-Chinese style management with lip service to elections. - Technicalities: there were about 48,000 ballot boxes. None of the candidates had representatives for all of them. Mousavi only had 5,000 approved representatives. Karrubi had even less than that. The Interior ministry did not issue the necessary documents for all those suggested as representatives. According to first hand reports, these election monitors witnessed only the counting process but they were not authorized to sign any document or approve anything. That means Mousavi and Karrubi do not have any "legal" documents to object to the results. The only hope that they may have is to reopen some boxes randomly and recount and see if there is a large meaningful difference between the outcome and what has been announced. Even in that case they may only be able to disqualify those particular boxes and not the whole election, unless that they can recount all boxes. Also there were at least 14,000 mobile boxes. There was no supervision on these boxes at all. Ahmadinejad and his team can easily manipulate those boxes according to their wishes. - They therefore engineered this election. Ahmadinejad had to have much more votes than Khatami in past elections. Karroubi had to be destroyed with that ridiculously low number of votes. Rezaie's economic plans/use of experts/professionals was to be killed off since they have their own economic plans. And of course Mousavi had to go. - In preparation for this, they foresaw some minor disturbances, put security forces on alert, and even warned the people against "agitation" (Khamenei's televised speech right after he cast his vote), but overall they thought the left are a bunch of sissies; shoot a few bullets in the air, intimidate, beat, and they go away. They have reason to believe this - over the past 20 years every time the system has come under some so called "threat" (e.g. via press freedom) or "expediency" (e.g. vetting of candidates) has been required, the left (e.g. Khatami) has backed down, to the point that the left has given up a lot and the right has advanced and gained a lot. - As for the fraud itself, one said he has official data from the past elections (2005) which shows that Ahmadinejad's gains in 2009 were almost entirely in the big cities, and not in the small provincial villages/cities in which he didn't gain as much. This by itself points to fraud, and also is the cause for the immense level of discontent in the large cities. People see who votes in their neighborhood and city and when they see the announced results, they know it can't be possibly true (he mentioned seeing people in line who were voting for the 2nd time in their life: the first time was at the Islamic Republic Referendum in 1979!). - Another point is that finally in this election, it became absolutely clear where the leader stands. In the past the reformists would go meet him, and seek his intervention, and he leaned this way and that. This time, he is firmly behind the takeover of power and this is clear to all. He has made his decision for the future. - So now, what has gone wrong? a) the fact that Khatami is not leading the movement (who would have backed out by now for "expediency"), but rather it is Mousavi who told the leader point blank in their meeting that there has been fraud and it has to be dealt with (after being told by the leader to "let go"); and b) people's demonstrations which have surprised even the left. He said from Tuesday morning till 3 pm, the Tehran District and Provincial Heads, and Head of police were on TV one after another over and over, warning people that if they take part in any demonstrations, that will be it! People didn't listen and 1 million showed up. - The reason you are not seeing foreign condemnation of this also is because the foreign countries are waiting for the government to finish its job. They foreign states will then recognize the President, and justify it saying the elections were fair and there are rioters everywhere in the world. The longer this recognition takes (the longer the government takes to "finish" things) the worse things will be; at some point they will have to make statements, do something, ... if there is killing and the problems continue they may be forced to recall ambassadors, downgrade relations, ... and that will be the kiss of death for the government who wanted to open up to the West and improve people's economic lot. - Will the reformists give up this time too? Both think unlikely since the reformists/left now understand 100% that this is their last stance; if they give up now, they will never, ever, be able to hold any power in Iran in the future. - This is confirmed by Ahmadinejad's three statements since the elections in which he has basically drawn out his sword and shown a no-compromise stance with respect to the reformists. - Government is in a bind now. They didn't expect the large demonstrations. And they can't do anything when people go to work and on way back home every single car is honking horns in protest, and when after dinner they go to the balcony and chant Allah-o-Akbar. The people realize that they are out of the government's equation. This is the reason for the revolt. - The only factor that can change the game is popular demonstrations by people, going on strike and with a high regret, some bloodshed. The amount of blood depends on the resistance of both sides. Only in that case the whole system will come under question and to retain legality they will need to do something, perhaps dramatic. - The best thing the US and EU can do is to not recognize this government, and downgrade relations. Else they will be seen as co-conspirators by the Iranian people. One CIA led coup in Iran's history is enough. Oman is looking into building solar and wind power plants to meet rising demand as the Gulf oil exporter faces a gas shortage, a government energy official said yesterday. "We are now turning to renewable energy like wind and solar to reduce the reliance on gas as the major fuel for power stations," Zahir Al-Suleimani, director general of projects at the Public Authority for Electricity and Water told Reuters in an interview. Electricity consumption is increasing by 15 percent annually and water by 10 percent due to industrial and infrastructure projects as well as domestic use." Gas demand is 13.6 million cubic meters per day and will increase to 20 million by 2015, according to Oman Power and Water Procurement Company figures. The government will need to import gas to meet that demand, that's the reason it makes sense to go for renewable and environmental friendly energy as alternative," Suleimani said. The non-OPEC oil exporter needs to increase gas supplies by 48 percent to 7.2 billion cubic meters (254.3 billion cu ft) a year by 2013 to fuel power and desalination plants. An energy official said in May that Oman aims to use coal to meet 20 percent of its energy needs by 2020 to reduce reliance on gas, and is setting up a new firm to buy coal to fire a planned 1,000 megawatt power station. projects was a contract for the $ 1.17 billion Muscat airport terminal last month. Brits shocked at segregation in Islamist group meeting - what did they expect? How could an Islamist extremist group meeting NOT segregate between men and women? What did they expect? What did this Douglas Murray think would happen in this debate? Of course their ideas don't "Stand up." They don't need to "Stand up" as they have thugs to make them stand up. An attempt to relaunch the controversial Islamist group Al-Muhajiroun ended in chaotic scenes after the management of the London venue that was to host the group's first meeting in five years cancelled proceedings, complaining "fundamentalist thugs" had tried to enforce the segregation of men and women. Supporters of the group, which wants sharia law in Britain and has praised the 9/11 terrorists as the "Magnificent 19", were ordered to leave Conway Hall in Holborn on Wednesday night when it emerged that Al-Muhajiroun had placed bouncers on the doors and were not letting women into the main hall. Speakers who had been invited to share a platform with Anjem Choudary, the group's leader, accused Al-Muhajiroun of inviting them under false pretences. Douglas Murray, director of the Centre for Social Cohesion, said the platform of the planned debate was "completely unacceptable". "I'm perfectly willing to debate Anjem Choudary and Al-Muhajiroun's ideas," he said. "His ideas are not difficult. They do not stand up. But it's very clear that this debate is not neutral. This was a segregated event, policed by Al-Muhajiroun's guards." He said he had been invited to the event by a student society, Global Issues Society, but the Islamist group had hijacked proceedings. Video - Iran's stolen elections. The first part is in Farsi but there is English translation. ELECTION FRAUD IN KERMAN, IRAN? Why are Iranians questioning the validity of the election results? Well, consider the case of Kerman, a city of half a million located in the southeast part of the country. According to the election map published this morning in the NYT, Ahmadinejad won over 70% of the votes in Kerman province. So what? you'd ask. Mousavi's influence is known to be limited to the big cities. It is just that a few hours ago a video showing a very large pro Mousavi demonstration was posted on Youtube. Take thirty seconds to watch it. Can such a demonstration have taken place in a genuine Ahmadinejad strong hold? Politics in Kerman are influenced by the former President Ali Akbar Hashemi Rafsanjani, his brother and Vice President Mohammad Hashemi Rafsanjani, and the Vice President Hossein Marashi, both from the nearby Rafsanjan. Rafsanjani is, of course, a major supporter of Mousavi. 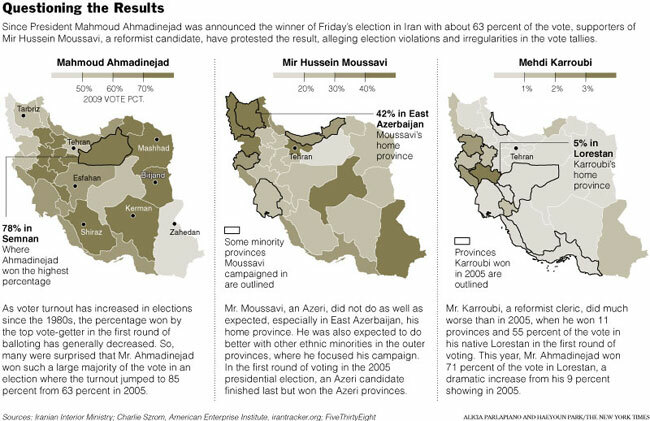 What are the chances that Ahmadinejad won over 70% of the votes there? It was inevitable that someone would claim that Mousavi is a Jew. That explains everything. Now we know who is responsible for all the problems in Iran. International Zionism. Update - Sorry folks. Though Iranian government is blaming the riots on the international something or other and though some people are insisting the CIA is behind this, this particular theory was posted as a hoax and I've been had. See here. It is well known Mousavi (of Moses) is a Jew and the demonstrations in Iran are the work of Mossad agent provocateurs. The ordinary people of Iran are peace loving and would not wish to threaten the Islamic revolution. The agitators are funded by international zionism and the Jew owned international media, in thrall to the zionist oppressors, are running alongside. One would be interested to know if this will be a big clumsy "gun" bomb, which requires much more material but is easier to make if less efficient, or a little implosion device that can fit in a suitcase or a warhead. One would also be interested to know how certain this prediction is, and whether or not it is likely Iran can have a bomb before 2014 "ready to use" (just add delivery system and stir). Without such details, and without knowing the intelligence on which the prediction was based, it is difficult to evaluate it in an intelligence way. Mossad chief Meir Dagan said Tuesday that the Islamic Republic will have a nuclear bomb ready for use by 2014. Speaking to the Knesset's Foreign Affairs and Defense Committee several days after the disputed Iranian elections, Dagan said that "what matters is the position of the [supreme] leader and this has not changed. The riots take place only in Teheran and one more region, they won't last for long." Dagan said the riots won't become a full-fledged revolution. The violence in the wake of the elections in Iran and allegations of vote rigging are not different from "any other democracy… the discussion within the Iranian elite… is an internal affair." Dagan said Israel would in fact have an easier time explaining the threat of Iranian nuclear weapons to the world when the country is led by a hardline fanatic president [reelected Mahmoud Ahmadinejad] than if Mir Hossein Mousavi, who is seen as a moderate, would win the election. "We mustn't forget Mousavi is the one who started the nuclear program." Regarding the nuclear threat, Dagan said Iran was closely following US response to recent threats made by North Korean despot Kim Jong Il. "If they see that the American policy can't bend or break North Korea, this will certainly affect the Iranians in future talks with the US. The Americans decided to try soft power on the Iranians… Iran thinks the world will come towards it." Iran, according to Dagan, "wants to be like Egypt was in the 1960s and 1970s. There is a lot of cooperation between Iran, North Korea and Syria. The notion of an Iranian nuclear weapon is an existential threat to Israel and has to be removed." Confronting a global economic crisis, the government acted swiftly to stabilize Israel's economy. We passed a two year budget in the government – and the Knesset will soon approve it. I turn to all Arab leaders tonight and I say: "Let us meet. Let us speak of peace and let us make peace. I am ready to meet with you at any time. I am willing to go to Damascus, to Riyadh, to Beirut, to any place- including Jerusalem. If we join hands and work together for peace, there is no limit to the development and prosperity we can achieve for our two peoples – in the economy, agriculture, trade, tourism and education - most importantly, in providing our youth a better world in which to live, a life full of tranquility, creativity, opportunity and hope. All this occurred during the fifty years before a single Israeli soldier ever set foot in Judea and Samaria . The Palestinian leadership must arise and say: "Enough of this conflict. We recognize the right of the Jewish people to a state of their own in this land, and we are prepared to live beside you in true peace." To vest this declaration with practical meaning, there must also be a clear understanding that the Palestinian refugee problem will be resolved outside Israel's borders. For it is clear that any demand for resettling Palestinian refugees within Israel undermines Israel's continued existence as the state of the Jewish people. The Palestinian refugee problem must be solved, and it can be solved, as we ourselves proved in a similar situation. Tiny Israel successfully absorbed hundreds of thousands of Jewish refugees who left their homes and belongings in Arab countries. So far I have spoken about the need for Palestinians to recognize our rights. In am moment, I will speak openly about our need to recognize their rights. But let me first say that the connection between the Jewish people and the Land of Israel has lasted for more than 3500 years. Judea and Samaria, the places where Abraham, Isaac, and Jacob, David and Solomon, and Isaiah and Jeremiah lived, are not alien to us. This is the land of our forefathers. The right of the Jewish people to a state in the land of Israel does not derive from the catastrophes that have plagued our people. True, for 2000 years the Jewish people suffered expulsions, pogroms, blood libels, and massacres which culminated in a Holocaust - a suffering which has no parallel in human history. As Israel's first Prime Minister David Ben-Gurion proclaimed in Israel's Declaration of Independence: "The Jewish people arose in the land of Israel and it was here that its spiritual, religious and political character was shaped. Here they attained their sovereignty, and here they bequeathed to the world their national and cultural treasures, and the most eternal of books." I have already stressed the first principle – recognition. Palestinians must clearly and unambiguously recognize Israel as the state of the Jewish people. The second principle is: demilitarization. The territory under Palestinian control must be demilitarized with ironclad security provisions for Israel. Therefore, today we ask our friends in the international community, led by the United States, for what is critical to the security of Israel: Clear commitments that in a future peace agreement, the territory controlled by the Palestinians will be demilitarized: namely, without an army, without control of its airspace, and with effective security measures to prevent weapons smuggling into the territory – real monitoring, and not what occurs in Gaza today. And obviously, the Palestinians will not be able to forge military pacts. If we receive this guarantee regarding demilitirization and Israel's security needs, and if the Palestinians recognize Israel as the State of the Jewish people, then we will be ready in a future peace agreement to reach a solution where a demilitarized Palestinian state exists alongside the Jewish state. If the Palestinians turn toward peace – in fighting terror, in strengthening governance and the rule of law, in educating their children for peace and in stopping incitement against Israel - we will do our part in making every effort to facilitate freedom of movement and access, and to enable them to develop their economy. All of this will help us advance a peace treaty between us. Hamas will not even allow the Red Cross to visit our kidnapped soldier Gilad Shalit, who has spent three years in captivity, cut off from his parents, his family and his people. We are committed to bringing him home, healthy and safe. If only our neighbors would respond to our call – peace too will be in our reach. With God's help, we will know no more war. We will know peace. Not everyone will agree with Fisk that Obama's life would have been made easier if Mousavi had been 'elected' (is that what it is called? ), especially since, as he notes, Mousavi favored a return to the conservative values of the Ayatollah Khomeini, whose insistence on wiping out the Great Satan is well known. But the frank picture of Iranian 'democracy' at work is a real 'kick in the balls' coming from someone like Fisk. Many of the protesters – some of them now wearing scarves over their faces, all coloured green, the colour of Mousavi's campaign – were trying to reach the Interior Ministry where the government's electoral council were busy counting (or miscounting, depending on your point of view) Friday's huge popular national vote. I descended into the basement of this fiercely ugly edifice – fittingly, it was once the headquarters of the Shah's party, complete with helipad on the roof – where cold chocolate lattes and strawberry fruitcake were on offer to journalists, and where were displayed the very latest poll results, put up at 10.56am Iranian time. Eighty per cent of the votes had been counted and the results came up as Ahmadinejad 64.78 per cent; Mousavi 32.26 per cent; Mohsen Rezai (a former Revolutionary Guard commander) 2.08 per cent; and Mehdi Karoubi (a former parliament speaker) a miserable 0.89 per cent. How could this be, a man asked me on a scorching, dangerous street an hour later. Karoubi's party has at least 400,000 members. Were they all sleeping on Friday? There were a few, sparse demonstrators out for the Democrator, all men, of course, and many of them draped in the Iranian flag because the Democrator – devout Muslim as he always displays himself – wrapped his election campaign in the national flag. Each of these burly individuals handed out free copies of the execrable four-page news-sheet Iran. "Ahmadinejad," the headline read, "24 million votes. People vote for Success, Honesty and the Battle against Corruption." Not the obvious headline that comes to mind. But Mousavi's Green Word newspaper allegedly had its own headline dictated to it by the authorities – before they shut it down yesterday: "Happy Victory to the People." And you can't get more neutral than that. Back on the streets, there were now worse scenes. The cops had dismounted from their bikes and were breaking up paving stones to hurl at the protesters, many of them now riding their own motorbikes between the rows of police. I saw one immensely tall man – dressed Batman-style in black rubber arm protectors and shin pads, smashing up paving stones with his baton, breaking them with his boots and chucking them pell mell at the Mousavi men. A middle-aged woman walked up to him – the women were braver in confronting the police than the men yesterday – and shouted an obvious question: "Why are you breaking up the pavements of our city?" The policeman raised his baton to strike the woman but an officer ran across the road and stood between them. "You must never hit a woman," he said. Praise where praise is due, even in a riot. But the policemen went on breaking up stones, a crazy reverse version of France in May 1968. Then it was the young men who wanted revolution who threw stones. In Tehran – fearful of a green Mousavi revolution – it was the police who threw stones. An interval here for lunch with a true and faithful friend of the Islamic Republic, a man I have known for many years who has risked his life and been imprisoned for Iran and who has never lied to me. We dined in an all-Iranian-food restaurant, along with his wife. He has often criticised the regime. A man unafraid. But I must repeat what he said. "The election figures are correct, Robert. Whatever you saw in Tehran, in the cities and in thousands of towns outside, they voted overwhelmingly for Ahmadinejad. Tabriz voted 80 per cent for Ahmadinejad. It was he who opened university courses there for the Azeri people to learn and win degrees in Azeri. In Mashad, the second city of Iran, there was a huge majority for Ahmadinejad after the imam of the great mosque attacked Rafsanjani of the Expediency Council who had started to ally himself with Mousavi. They knew what that meant: they had to vote for Ahmadinejad." But of course, the streets of Tehran were only a hundred metres away. And the police were now far more abusive to their adversaries. My own Persian translator was beaten three times on the back. The cops had brought their own photographers on to the pavements to take pictures of the protesters – hence the green scarves – and overfed plain-clothes men were now mixing with the Batmen. The Democrator was obviously displeased. One of the agents demanded to see my pass but when I showed my Iranian press card to him, he merely patted me on the shoulder and waved me through. Thus did I arrive opposite the Interior Ministry as the police brought their prisoners back from the front line down the road. The first was a green-pullovered youth of perhaps 15 or 16 who was frog-marched by two uniformed paramilitary police to a van with a cage over the back. He was thrown on the steel floor, then one of the cops climbed in and set about him with his baton. Behind me, more than 20 policemen, sweating after a hard morning's work bruising the bones of their enemies, were sitting on the steps of a shop, munching through pre-packed luncheon boxes. One smiled and offered me a share. Politely declined, I need hardly add. They watched – and I watched – as the next unfortunate was brought to the cage-van. In a shirt falling over his filthy trousers, he was beaten outside the vehicle, kicked in the balls, and then beaten on to a seat at the back of the vehicle. Another cop climbed in and began batoning him in the face. The man was howling with pain. Another cop came – and this, remember, was in front of dozens of other security men, in front of myself, an obvious Westerner, and many women in chadors who were walking on the opposite pavement, all staring in horror at the scene. Now another policeman, in an army uniform, climbed into the vehicle, tied the man's hands behind his back with plastic handcuffs, took out his baton and whacked him across the face. The prisoner was in tears but the blows kept coming; until more young men arrived for their torment. Then more police vans arrived and ever more prisoners to be beaten. All were taken in these caged trucks to the basement of the Interior Ministry. I saw them drive in. A break now from these outrages, because this was about the moment that Mousavi's printed statement arrived at his campaign headquarters. I say "arrived", although the police had already closed his downtown office – Palestine Street, it was called, only fitting since the Iranian police were behaving in exactly the same way as the Israeli army when they turn into a rabble to confront Palestinian protesters – and Mousavi's men could only toss the sheets of paper over the wall. It was strong stuff. "The results of these elections are shocking," he proclaimed. "People who stood in the voting lines, they know the situation, they know who they voted for. They are looking now with astonishment at this magic game of the authorities on the television and radio. What has happened has shaken the whole foundation of the Islamic Republic of Iran and now it is governing by lies and dictatorship. I recommend to the authorities to stop this at once and return to law and order, to care for the people's votes. The first message of our revolution is that people are intelligent and will not obey those who gain power by cheating. This whole land of Iran belongs to them and not to the cheaters." Mousavi's head office in Qeitariyeh Street in north Tehran had already been besieged by the Democrator's loyal "Basiji" volunteers a few hours earlier. They had chucked tear gas at the windows. They were still smouldering when I arrived. "Please go or they will come back," one of his supporters pleaded to me. It was the same all over the city. The opposition either asked you to leave or invited you to watch them as they tormented the police. The Democrator's men, waving their Iranian flags, faced off Mousavi's men. Then, through their ranks, came the armed cops again, running towards the opposition. So whose side were the police really on? Rule number one: never ask stupid questions in Iran. Last night, all SMS calls were blocked. The Iranian news agency announced that, since there would be no second round of elections, there would be no extension of visas for foreign journalists – one can well see why – and so many of the people who were praised by the government for their patriotism in voting on Friday were assaulted by their own government on Saturday. Last night, the Democrator was still silent, but his ever-grinning face turned up on the posters of his supporters. There were more baton charges, ever greater crowds running from them. Thus was the courage of Friday's Iranian elections turned into fratricidal battles on the streets of Tehran. "Any rallies," announced the Tehran police chief, General Ahmad Reza Radan, "will be dealt with according to the law." Well, we all know what that means. So does the Democrator. Mahmoud Ahmadinejad is the blacksmith's son and former Revolutionary Guard, who, since his surprise victory four years ago, has seemingly gone out of his way to play bogeyman to the US. In his first term in office, Mr Ahmadinejad became known for his fierce rhetoric against America and Israel, his proud promotion of Iran's nuclear programme and persistent questioning of the Holocaust. In Iran, he benefited from a surge in petrodollar revenues and has distributed loans, money and other help on his frequent provincial tours. But critics say his free spending fuelled inflation and wasted windfall oil revenues without reducing unemployment. Prices of basics have risen sharply, hitting more than 15 million Iranian families who live on less than $600 a month. He blamed the inflation, which officially stands at 15 per cent, on a global surge in food and fuel prices that peaked last year, and pursued unorthodox policies such as trying to curb prices while setting interest rates well below inflation. During the campaign, in a series of bitter TV debates with his three rivals, he was repeatedly accused of lying about the extent of price rises. Mir Hossein Mousavi also accused Mr Ahmadinejad, 53, of undermining Iran's foreign relations with his fiery anti-Western speeches and said Iranians had been "humiliated around the globe" since he was first elected. During Mr Ahmadinejad's first term, the UN Security Council imposed three sets of sanctions on Iran over its nuclear programme, which the West suspects has military aims. Mr Ahmadinejad, the first non-clerical president in more than 25 years, basks in the support of Iran's Supreme Leader, Ayatollah Ali Khamenei, who called on Iranians to vote for an anti-Western candidate. The Ayatollah ultimately calls the shots in Iran, where the president can only influence policy, not decide it. Life for President Barack Obama would be a great deal easier if Mir Hossein Mousavi had won Iran's election. The man who was prime minister during the Iran-Iraq war of the 1980s says he would seek detente with the West, ask Mr Obama to debate at the UN with him, and floated the idea of an international consortium overseeing uranium enrichment in Iran. The highlight of Benjamin Netanyahu's speech this evening was support for a Palestinian state alongside the Jewish state of Israel. Netanyahu insisted that the state would be demilitarized and could not form alliances with other states against Israel. That is no more and no less than has been Israeli policy in fact, at least since 2000. What Benjamin Netanyahu did not say could fill a book. He did not say what Israel is going to do about illegal outposts, and he didn't talk in detail about the situation in Gaza. He neither demanded directly that the Palestinians or the United States take steps to change the regime in Gaza or at least to bring about the release of kidnapped soldier Gilad Schalit, nor did he promise any humanitarian concessions in Gaza. The purpose of this speech was to give Barack Obama one of the concessions he demanded: Israeli support for a Palestinian state. Mission accomplished. Netanyahus concession has already stirred up a bit of a ruckus in the Likud party, where several MKs are contemplating a revolt. The White House welcomed the speech, while the Palestinians rejected it. They complained that Israel does not concede East Jerusalem, and that Netanyahu did not concede right of return for Palestinian refugees. But no Israeli government is going to allow the refugees to return, and it is unreasonable to expect any concessions from Israel regarding Jerusalem, as long as Palestinians refuse to even admit that Jerusalem was the capital of a Jewish state in ancient times. Israel has recognized the right of the Palestinians to a state of their own. It is only right that the Palestinians, after 60 years, should recongize the right of the Jews to a state of our own. Aluf Benn was correct when he wrote that Obama will decide how good Netanyahu's speech is, and apparently it is good enough. In the nature of things, Netanyahu having made a major concession, the Palestinians might be expected to follow suit, if the world is fair. The world, however, is not necessarily fair. Peace was always the desire of our people. Our prophets had a vision of peace, we greet each other with peace, our prayers end with the word peace. This evening we are in the center named for two leaders who were groundbreakers for peace -Menachem Begin and Anwar Sadat - and we share their vision. The second challenge, rather, the third, so very important challenge, facing us today, is promoting peace. I discussed this also with President Obama. I strongly support the idea of regional peace that he is advancing. I share the President of the U.S.A's desire to bring about a new era of reconciliation in our region. I call upon the leaders of the Arab countries to join together with the Palestinians and with us to promote economic peace. Economic peace is not a substitute for peace, but it is a very important component in achieving it. Together we can advance projects that can overcome the problems facing our region. For example, water desalinization. And we can utilize the advantages of our region, such as maximizing the use of solar energy, or utilizing its geographical advantages to lay pipelines, pipelines to Africa and Europe. Let us join hands and work together in peace, together with our neighbors. There is no limit to the flourishing growth that we can achieve for both peoples - in the economy, in agriculture, in commerce, tourism, education - but, above all, in the ability to give our younger generation hope to live in a place that?s good to live in, a life of creative work, a peaceful life with much of interest, with opportunity and hope. I now am asking that when we speak of the huge challenge of peace, we must use the simplest words possible, using person to person terms. Even with our eyes on the horizon, we must have our feet on the ground, firmly rooted in truth. The simple truth is that the root of the conflict has been ? and remains - the refusal to recognize the right of the Jewish People to its own state in its historical homeland. The right of the Jewish People to a state in the Land of Israel does not arise from the series of disasters that befell the Jewish People over 2,000 years -- persecutions, expulsions, pogroms, blood libels, murders, which reached its climax in the Holocaust, an unprecedented tragedy in the history of nations. There are those who say that without the Holocaust the State would not have been established, but I say that if the State of Israel had been established in time, the Holocaust would not have taken place. (Applause) The tragedies that arose from the Jewish People?s helplessness show very sharply that we need a protective state. But, friends, we must state the whole truth here. The truth is that in the area of our homeland, in the heart of our Jewish Homeland, now lives a large population of Palestinians. We do not want to rule over them. We do not want to run their lives. We do not want to force our flag and our culture on them. In my vision of peace, there are two free peoples living side by side in this small land, with good neighborly relations and mutual respect, each with its flag, anthem and government, with neither one threatening its neighbor?s security and existence. These two facts ? our link to the Land of Israel, and the Palestinian population who live here, have created deep disagreements within Israeli society. But the truth is that we have much more unity than disagreement. And, to ensure peace we don?t want them to bring in missiles or rockets or have an army, or control of airspace, or make treaties with countries like Iran, or Hizbullah. There is broad agreement on this in Israel. We cannot be expected to agree to a Palestinian state without ensuring that it is demilitarized. This is crucial to the existence of Israel ? we must provide for our security needs. This is why we are now asking our friends in the international community, headed by the USA, for what is necessary for our security, that in any peace agreement, the Palestinian area must be demilitarized. No army, no control of air space. Real effective measures to prevent arms coming in, not what?s going on now in Gaza. The Palestinians cannot make military treaties. I call upon Arab leaders and Palestinian leaders: Let?s go in the path of Menachem Begin and Anwar Sadat, Yitzhak Rabin and King Hussein. Let?s go in the path of Prophet Isaiah, who spoke thousands of years ago, they shall beat their swords into plowshares and know war no more. Should the Gulf have its own peace envoy?